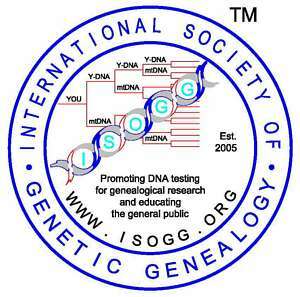 Because of continuing research, the structure of the Y-DNA Haplogroup Tree changes and ISOGG does its best to keep the tree updated with the latest developments in the field. The viewer may observe other versions of the tree on the Web. Email Alice Fairhurst if the differences need clarification or if you find any broken links on this page. Private SNPs - After having been investigated, these SNPs have not met the population distribution criteria for placement on the tree. Either too few confirmed positive testers have been found OR multiple confirmed testers were confined to either a single surname or to a small group of related males. M59 found in the same sample from Ethiopia. Listed 15 February 2012. M171 found in a single A3a2 (the former A3b2, positive for M13 or its equivalents) sample from Sudan. Listed 15 February 2012. L1100 and L1149 are located downstream of L1086. Reported in Perry surname. Listed 5 March 2013. SNPs under Investigation - Additional testing is needed to confirm adequate positive samples and/or correct placement on the tree. V67 is found downstream of V161,2. Listed 15 February 2012. Page52.3 has been found derived in the current hg A-P262 WTY sample from the U of A. It is ancestral in A-L896 and in A-M13. Listed 15 February 2012. PK1 may be philogenically equivalent to BT. Listed 10 July 2012. Page10 may be philogenically equivalent to M144. Listed 10 July 2012. V139.1 and V141 are located at approximately M14. Listed 26 February 2013. L949, L950, L951, L952, L954, L955, L956, L958, L959, L961, L964, L965, L966, L973, L974, L975, and L976 are located at approximately P262. Listed 26 February 2013. PF825.1 is located at approximately V148. Listed 26 June 2013. Identical SNPs that were discovered separately are listed in alphabetical order, not necessarily in the order of discovery, and separated by "/". Examples: M29/P3/PN3, M276/P247 and M277/P248. PK1 (formerly A2) and M63 (formerly A3b2) were removed from the tree due to the uncertainty of their placement. A0 is being used to emphasize that this constitutes a haplogroup distinct from A1 and downstream clades, although for practical reasons, the letter A will still be used in its name, following the precedent of the addition of L0 and its subclades to the mtDNA phylogenetic tree. Listed 15 February 2012. There is some uncertainty about the position of M14, M29/P3/PN3, M71, M135, M141, M206, M276/P247, M277/P248, MEH1, P4, P5, P36.1, Page71, Page87, and Page95, since although they have been considered equivalent to M23 in the past, they have not yet been tested in the A2* sample in which V50, V82, etc, are derived and M23 is ancestral. Listed 15 February 2012. BT is shown on this tree, though it is not considered to be a part of Haplogroup A, in order to make it clear that, as a sibling clade with A1b1 and A1b2, BT and all other haplogroups are downstream of A1b. Listed 15 February 2012. The naming conventions of the subclades at the beginning of the tree come from the supplement to Mendez et al (2013). Listed 5 March 2013. Y-DNA haplogroup A contains lineages deriving from the earliest branching in the human Y chromosome tree. The oldest branching event, separating A0-P305 and A1-V161, is thought to have occurred about 140,000 years ago. Haplogroups A0-P305, A1a-M31 and A1b1a-M14 are restricted to Africa and A1b1b-M32 is nearly restricted to Africa. The haplogroup that would be named A1b2 is composed of haplogroups B through T. The internal branching of haplogroup A1-V161 into A1a-M31, A1b1, and BT (A1b2) may have occurred about 110,000 years ago. A0-P305 is found at low frequency in Central and West Africa. A1a-M31 is observed in northwestern Africans; A1b1a-M14 is seen among click language-speaking Khoisan populations. A1b1b-M32 has a wide distribution including Khoisan speaking and East African populations, and scattered members on the Arabian Peninsula. Batini et al, Signatures of the Preagricultural Peopling Processes in Sub-Saharan Africa as Revealed by the Phylogeography of Early Y Chromosome Lineages. (abstract) Molecular Biology and Evolution. 28 (9): 2603-2613, 2011. Cruciani et al, A Back Migration from Asia to Sub-Saharan Africa Is Supported by High-Resolution Analysis of Human Y-Chromosome Haplotypes. American Journal of Human Genetics, 70:1197-1214, 2002. Cruciani et al, A Revised Root for the Human Y Chromosomal Phylogenetic Tree--The Origin of Patrilineal Diversity in Africa. The American Journal of Human Genetics, doi:10.1016/j.ajhg.2011.05.002, 2011. Mendez et al, An African American Paternal Lineage Adds an Extremely Ancient Root to the Human Y Chromosome Phylogenetic Tree. (abstract) American Journal of Human Genetics 28 February 2013. Mohyuddin et al, Detection of Novel Y SNPs Provides Further Insights into Y Chromosomal Variation in Pakistan. Journal of Human Genetics, 2006. Rozen et al, Remarkably Little Variation in Proteins Encoded by the Y Chromosome's Single-Copy Genes, Implying Effective Purifying Selection. American Journal of Human Genetics. 2009 December 11; 85(6): 923-928. Schuster et al, Complete Khoisan and Bantu Genomes from Southern Africa. (abstract) Nature 463, 943-947, 18 February 2010. Scozzari et al, An Unbiased Resource of Novel SNP Markers Provides a New Chronology for the Human Y Chromosome and Reveals a Deep Phylogenetic Structure in Africa, Genome Research, Vol. doi:10.1101/gr.160788.113, 2014. Semino et al, Ethiopians and Khoisan Share the Deepest Clades of the Human Y-Chromosome Phylogeny. (pdf) American Journal of Human Genetics, 70:265-268, 2002. Valone et al, Y SNP Typing of African-American and Caucasian Samples Using Allele-Specific Hybridization and Primer Extension. (pdf) Journal of Forensic Science, 49:4, July 2004. Y Haplogroup A, Bonnie Schrack. The African DNA Project (A), Dr. Ana Oquendo Pabon. Added CTS2809, PF1079, PF1374 to tree; added PF1287, PF1300 to Investigation on 30 January 2014. Added M9462, PF1361, PF1363, PF1366, PF3627.1 to Investigation on 2 January 2014. Added M9531 to Investigation on 5 March 2014. Added CTS5903/M9174/PF795/S1572 to tree on 14 August 2014. Moved L957, L970/PF1065, L971, L977 from BT to CT on Main Tree on 15 August 2014. Added CTS7503/M9219, L1071/M8945, L1220/M9212, M251/M9122/PF699, M8947, M8949, M8951, M8952, M8953/PF1405/V216, M8954, M8955/PF12, M8956, M8957, M8958/PF196, M8959, M8961/PF201, M8967, M8968/PF207, M8969/PF1407/V21, M8970/PF208, M8971, M8972, M8973, M8976/PF215, M8977, M8979/PF226, M8980/PF229, M8983/PF230, M8985/PF232, M8986, M8988, M8993, M8994, M8995, M8997/PF260, M8999, M9000, M9001, M9003, M9004/PF270, M9005, M9006, M9008, M9009, M9010, M9011, M9015, M9016, M9017/PF282, M9019/PF286, M9020/PF287, M9021/PF288, M9025, M9026, M9027, M9028/PF298, M9030, M9031, M9032/PF304, M9034, M9036/PF308, M9037, M9038/PF313, M9039, M9041/PF319, M9042, M9043, M9045, M9046/PF324, M9054, M9056, M9057, M9064/PF350, M9065/PF351, M9066, M9069/PF635, M9070, M9075, M9076, M9077, M9079, M9080, M9081, M9083, M9086/PF648, M9087, M9089/PF653, M9094/PF671, M9095, M9097/PF672, M9098, M9099/PF674, M9100, M9102, M9103/PF679, M9105, M9109, M9110/PF684, M9111, M9112, M9113, M9114, M9115, M9116/PF688, M9117, M9118/Page81, M9121, M9123, M9124/PF701, M9125, M9126/PF703, M9127, M9128, M9129/PF707, M9130/PF708, M9131, M9133/PF715, M9135, M9136/PF724, M9138, M9139, M9140, M9141, M9142/PF731, M9143/PF732, M9145/PF733, M9146, M9148/PF744, M9151, M9152, M9155/PF762, M9156/PF764, M9157/PF766, M9159/PF767, M9160/Page24, M9162, M9163/PF777, M9165, M9166/PF785, M9169, M9172, M9173/PF794, M9176, M9177, M9178, M9179, M9180, M9182, M9187, M9188, M9189, M9192, M9193, M9194.3/PF825.3, M9195, M9196, M9197, M9198, M9199/PF834, M9200/PF835, M9202, M9203/PF837, M9204, M9209, M9210, M9213, M9214, M9215/PF847, M9216, M9217/PF857, M9218/PF860, M9220, M9221, M9223/PF865, M9225/PF868, M9226/PF869, M9227, M9228, M9230/PF870, M9231/PF876, M9234, M9235/PF886, M9237/PF890, M9238, M9239, M9240/PF896, M9242/PF899, M9244, M9245, M9246, M9248, M9249, M9251/PF913, M9252, M9253/PF914, M9254, M9255/PF925, M9257, M9258, M9260, M9261/PF931, M9262/PF932, M9263, M9265, M9266/PF946, M9267/PF948, M9269, M9271, M9277, M9278/PF969, M9280, M9282, M9283/PF973, M9284, M9285, M9286, M9287, M9288/PF985, M9289/PF988, M9290/PF989, M9291, M9292, M9293/PF997, M9295/PF1000, M9296, M9298, M9300, M9301/PF1015, M9302, M9303, M9306, M9310, M9311/PF1030, M9312, M9314, M9315/PF1033, M9316/PF1034, M9317, M9318, M9319, M9321/PF1045, M9322/PF1049, M9323/PF1050, M9325, M9326, M9327, M9328/PF1053, M9331/PF1057, M9334, M9335/PF1060, M9336/Page26, M9338/PF1064, M9340, M9341/PF1072, M9343, M9344, M9346, M9347, M9348/PF1093, M9349, M9352/PF1100, M9353, M9356, M9357/PF1209, M9359, M9360, M9361, M9362, M9365/PF1218, M9366, M9367, M9368, M9369, M9370, M9372, M9373, M9374/Z4690, M9376, M9377/PF1421, M9378, M9379/PF1253, M9380/PF1256, M9382/PF1257, M9387, M9389, M9390/PF1262, M9393, M9394/PF1271, M9396, M9397, M9398/PF1279, M9399/PF1283, M9405, M9406, M9408/PF1296, M9410, M9411/PF1315, M9412, M9417, M9420, M9421, M9425, M11752, M11753/PF243, M11754, M11755/PF280, M11756/PF301, M11757/PF327, M11759, M11760, M11762, M11767, M11773/PF809, M11779/PF1027, M11780/PF1044, M11781, M11787/PF1311, M11789/PF1332, PF16, PF20, PF28, PF51, PF69, PF72, PF73, PF79, PF122, PF127, PF133, PF135, PF149, PF161, PF162, PF167, PF175, PF177, PF236, PF338, PF420, PF462, PF468, PF509, PF585, PF591, PF592, PF601, PF620, PF622, PF626, PF627, PF632, PF713, PF918, PF1026, PF1042, PF1096, PF1143, PF1178, PF1184, PF1196, PF1201, PF1247, PF1248, PF1249, PF1252, PF1274, PF1318, PF1325, Z11924, Z11926, Z11927, Z11929, Z11930, Z11931, Z11932, Z11933, Z11937, Z11938, Z11939, Z11940, Z11941, Z11943, Z11945, Z11948, Z11970, Z11971, Z11978, Z11979, Z11980, Z11981, Z11983, Z11984, Z11985, Z11986, Z11987, Z11988, Z11989, Z11990, Z11991, Z11993, Z11997, Z11999, Z12001, Z12002, Z12003, Z12004, Z12005, Z12006, Z12007, Z12008, Z12031, Z12047, Z12070, Z12071, Z12077, Z12094, Z12095, Z12096, Z12110, Z12111, Z12128, Z12129, Z12138, Z12139, Z17332, Z17333, Z17334, Z17335, Z17336, Z17337, Z17338, Z17339, Z17340, Z17341, Z17342, Z17343, Z17344, Z17345, Z17346, Z17347, Z17348, Z17349, Z17350, Z17351, Z17352, Z17353, Z17354, Z17355, Z17356, Z17357, Z17358, Z17359, Z17360, Z17361, Z17362, Z17363, Z17364, Z17365, Z17366, Z17367, Z17368, Z17369, Z17370, Z17371, Z17372, Z17373, Z17374, Z17375, Z17376, Z17377, Z17378, Z17379, Z17380, Z17381, Z17382, Z17383, Z17384, Z17385, Z17386, Z17387, Z17388, Z17389, Z17390 to tree on 16 August 2014. Added Scozzari et al (2014) on 11 September 2014. Moved L989, L1009, L1013, L1053 from A1 to A1b on 17 October 2014. Added FGC8027, M11301/Z11908, Z11891, Z11892, Z11893, Z11894, Z11895, Z11896, Z11897, Z11898, Z11899, Z11900, Z11901, Z11902, Z11903, Z11904, Z11905, Z11906, Z11907, Z11909, Z11910, Z11911, Z11912, Z11913, Z11914, Z11915, Z11916, Z11917, Z11918, Z11919, Z17890, Z17891, Z17892, Z17893, Z17894, Z17895, Z17896, Z17897, Z17898, Z17899, Z17900 to tree on 18 October 2014. Copyright 2014, International Society of Genetic Genealogy. All Rights Reserved.